In the mountainous regions of northern Greece, Sarens operators have been installing a coal power plant structure at the PPB Power Plant Ptolemaida Unit V.
The installation work is being performed on behalf of client Terna, at the site of a 550MW coal-fired power station. Ptolemaida V, the station's fifth unit, is currently under construction. Once it begins operation in 2020, it will have a generating capacity of 660MW. The installation involves columns and K-bracings for the main steel structure, with the 146t K-bracings (30m x 10m x 2m) picked up at a radius of 65.5m. To raise the K-bracings from a horizontal to vertical position, operators use the main CC8800 crane and a CC2400 or LR1750 auxiliary crane. 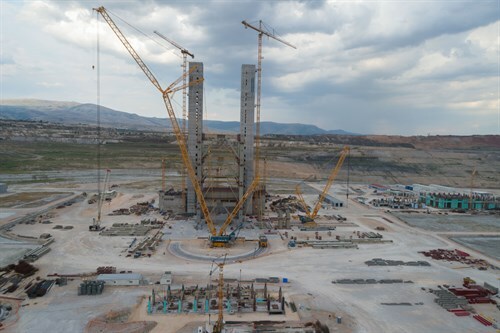 Sarens lifts two K-bracings (292t in total) and four columns (523t in total) per day, and the items are lifted with CC8800 only slewing. For this operation, equipment from across the globe has been dispatched to Ptolemaida, with cranes arriving by sea and road from South America, the Middle East, and Europe. Among them are a CC8800-1 SWSL, a CC2400-1 S and two LR1750 SDBW. "The team performed the operation in a safe and planned manner," said project manager Karel Maesfrancx. "The ground preparation was done according to the contract and very well executed by Terna. Another LR1750 will arrive on the site in the next few weeks and then all cranes will stay there through the middle of 2018, except the CC8800-1, which will probably finish by October of this year."